Although robust to the point that it will last you a lifetime, Els & Co.'s Passport Sleeve is compact enough to fit into your jacket pocket making travelling just that tiny bit more comfortable. It fits two passports for those with dual citizenship and there is room for a credit card and your drivers license / identity card, which is all you need between airports. At Els & Co. pride in what we do trumps how many products we can make. Every items is thus made from start to finish by a single craftswomen and her initials are stamped onto the leather. Visit OUR TEAM on our website for a small bio on each craftsowmen in our team. 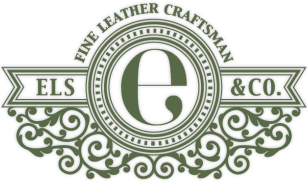 Our products are dyed, moulded and stitched by hand using only the best quality vegetable tanned leather we can find. The wax coated cottan thread together with our polish mixture of beeswax and animal fat gives you a classic old school finish rarely seen today.